A full-cast dramatisation of one of the greatest war novels of all time. 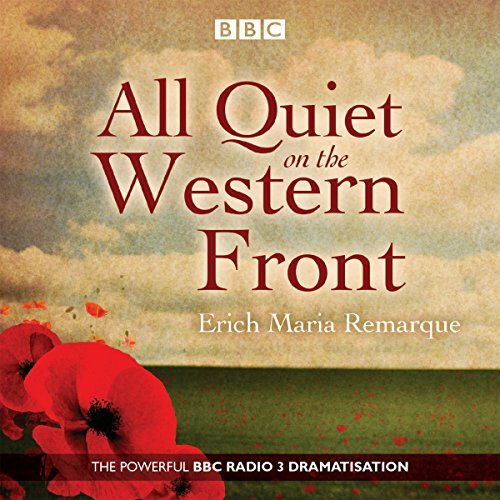 First published as a novel in 1929, All Quiet on the Western Front tells the story of a group of young German soldiers who are enduring, and then coming to terms with, the realities of the First World War. At the age of 19, following the outbreak of the First World War, Paul Bäumer enlists in the German Army. He is deployed to the Western Front, where the experience of life and death in the trenches has an enormous effect on him. He begins to feel disconnected from his past life: his family, his love of poetry, and his feelings. As the war progresses, Paul becomes increasingly lost in battle. Haunting yet comic, lyrical yet desperate, the novel became a best seller on its original publication. It inspired an Oscar-winning film of the same name, and has been adapted for television and stage. This powerful radio dramatisation stars Robert Lonsdale as Paul Bäumer, with a supporting cast including Simon Trinder, Stephen Critchlow, Carolyn Pickles, and Malcolm Tierney. Read the book before you listen to this. It was really well dramatized but like in movies it was so condensed that the majority of the magic was muted because they sped through scenes that in my mind lasted hours. This is really good if you want to refresh yourself on the events but not good as an introduction to the story itself. This bbc radio program is very well acted. It is also quite thought provoking. A good drama.